One of my favourite, under worn dresses is this one by Celia Birtwell for Topshop. I thought I'd wear it over the weekend for going into town. I've a long sleeved red Gap tee underneath to keep the warmth in and my customised Levi's sleeveless jacket that I cut the sleeves off a few months back. I'm normally in jeans at the weekend, so it makes a change for me to wear a dress in autumn!!! That is a beautiful dress.Have a nice weekend. I love the jacket! So need one. A lovely dress with great colours. It goes so well with the jacket but I bet you can dress it up too. Great look - you look lovely! Hi again - how spooky you said the same as me. I was responding to anon. Also I've got another channelling post about you to come this week. I kid you not I read your post on Saturday morning and bingo! You are still in jeans, just on the top not the bottoms. You look fantastic. You look great, its a great dress and love the boots too. wish you took close up photo of it. i would love to see the details on it. Lovely dress! Throw on some denim and you're casually chic for the weekend :) Perfect! I bet you had a good day in town :)! OMG! I love Ur dress too, darling Sharon! I really like the cool colors. they go great with the deninum. 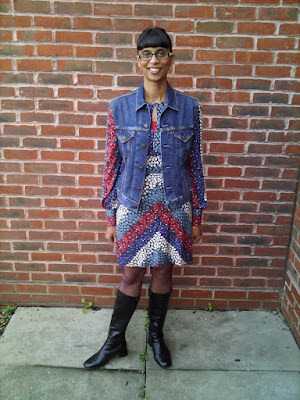 Great dress and Iooks fab with the jacket and boots! Great look and I love the boots! Cute dress -- I always like to see you in Celia! Hi there-thanks so much for all your wonderful comments, so much appreciated!! I'm the queen of dresses and opaque tights in winter, so welcome to the club. Perfect weekend wear. Love the boots! Awesome dress... love the colors! And great job with making the Levis a sleeveless jacket! By the way, thanks for the thrifting tips. I definitely found them useful, seeing as how I find thrifting to be a little overwhelming. The next time I'm in London, I'll make a point of visiting more charity shops. Hope you have a lovely week! Hi ladies-thanks so much to you all!! You look so nice dear!!!! That's a fabulous dress and looks chic casual with the vest. What I love the most???.... your smile!!!!! Wow! that dress is amazing. The detail is gorgeous... I love it! Oh what a beautiful dress! I love the colors and pattern. I love the dress-with-boots look for colder months! I really want to try it out this year. I love the vintage denim jacket, as well. I found one recently too, and can't wait to wear it! Hi everyone-thanks for all your kind comments! !